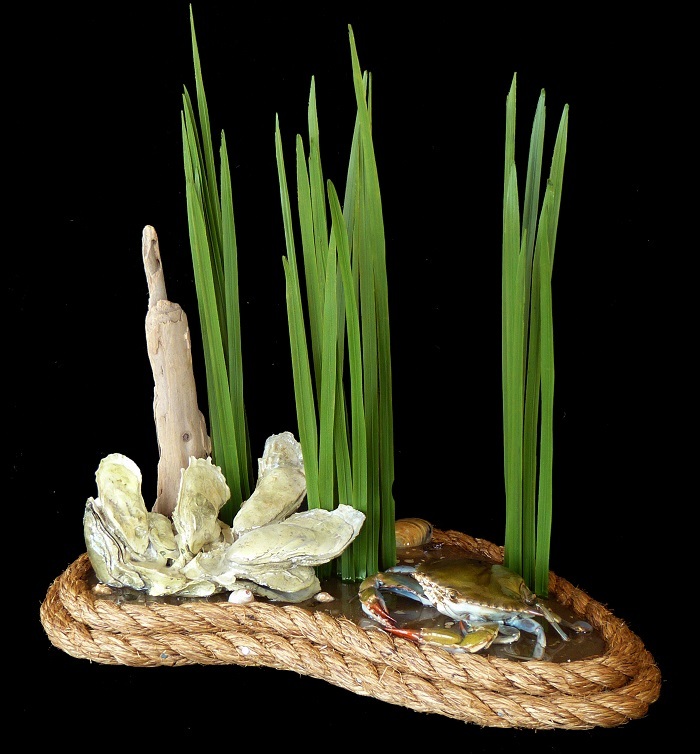 Pete Miller's Water and Wildlife Studio is The Home of the Original Real Blue Crab Nautical Table Lamp. All blue crab habitat and nautical lamps come signed and numbered. The blue crab is guaranteed against color loss and microbiological defects for 20 years provided it is not exposed to moisture or direct sunlight. All lamps come with 3-way sockets rated for up to 250 watt bulbs and high quality shades. Rubber or felt feet protect your furniture. All small lamps stand about 25 inches tall and all large lamps stand about 27 inches. 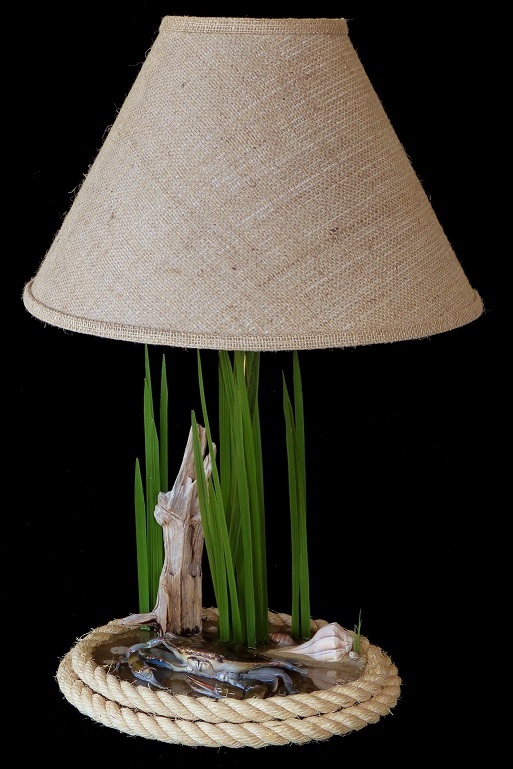 These unique lamps are a great addition to any Florida room, sun room, living room or any room in the beach house and they are a guaranteed conversation piece. 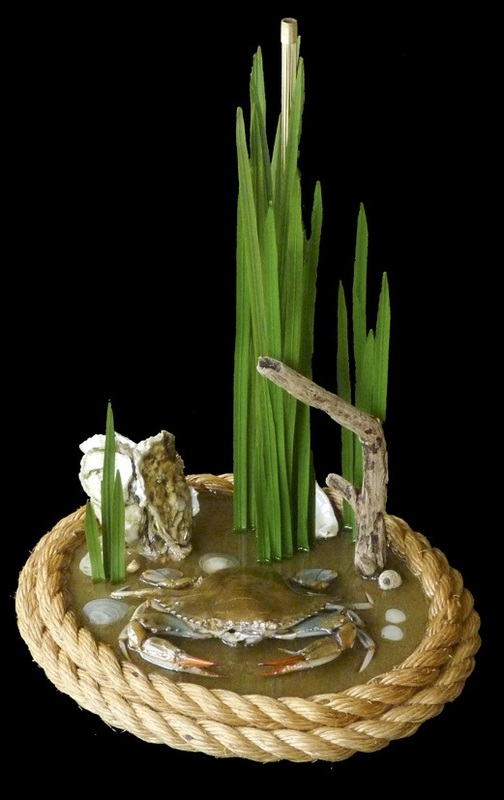 They are perfect home decor for blue crab lovers of the Chesapeake Bay and Maryland waters. Please allow 2 - 4 weeks for delivery! International orders may take longer. I will contact you with a estimated ship date within 72 hours of receiving your order. For lamps ready for immediate delivery please see the "Gallery of Coastal Decor" section of this website. Professionally freeze dried and air brushed blue crab (at leas 5.0 inches across back shell) sits in the calm, shallow water amid assorted seashells including a small sand dollar and starfish embedded in my secret recipe sand formula. 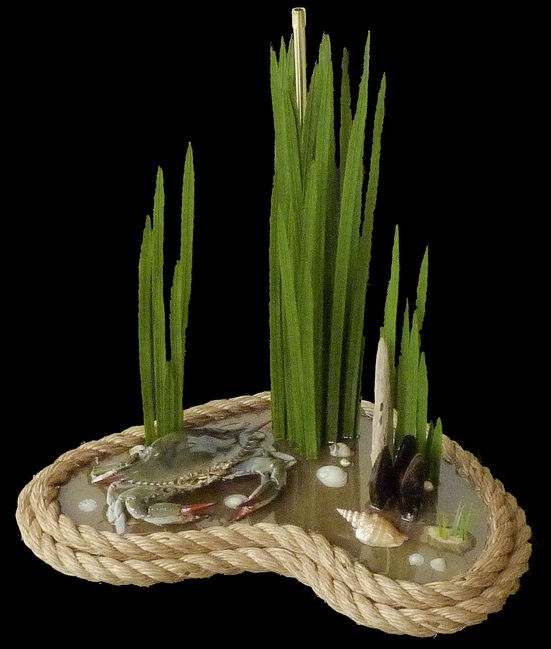 Super high quality artificial marsh individually hand - cut to length and crystal clear artificial water complete the naturally beautiful artwork. All pieces are signed and numbered. A warranty card with cleaning and care instructions is included. Dust with a feather duster as needed to keep your unique piece of blue crab habitat art looking brand new. Lamp stands about 25 inches tall and the base is 13 inches long and 11 inches wide. Shade shown is burlap and measures 5x16x11 top,bottom and side. You can have a pleated linen shade if you prefer and let me know if you require a taller lamp. If you want to supply your own shade for one of these rare blue crab nautical art lamps, contact me and I will give you the cost including shipping. Checks and money orders are welcome - please understand your order will not ship until the check has cleared. PayPal is the most secure way to shop on-line; please call (252) 269-0241 if you prefer to have me process your credit card information. 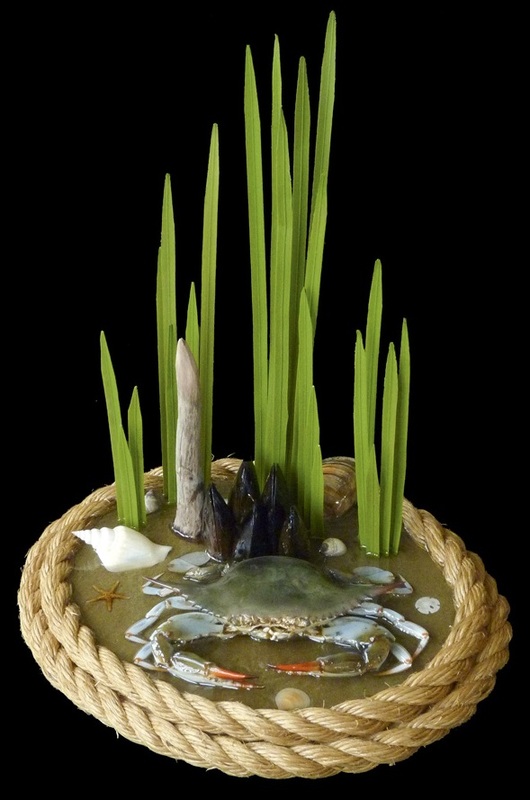 This pic is of a table piece, but a blue crab art lamp very similar can be made just for you. 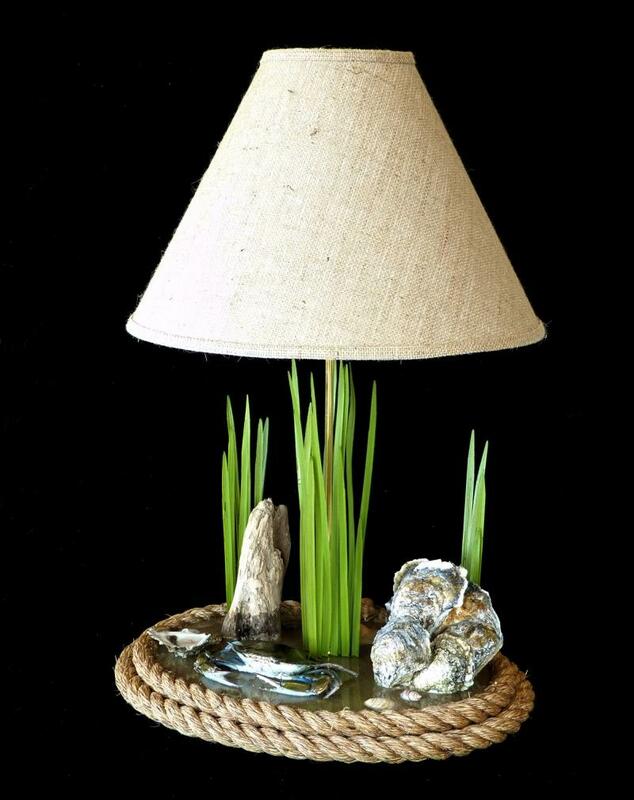 close up of small oval blue crab art nautical lamp with oysters and clams minus the burlap shade and socket. 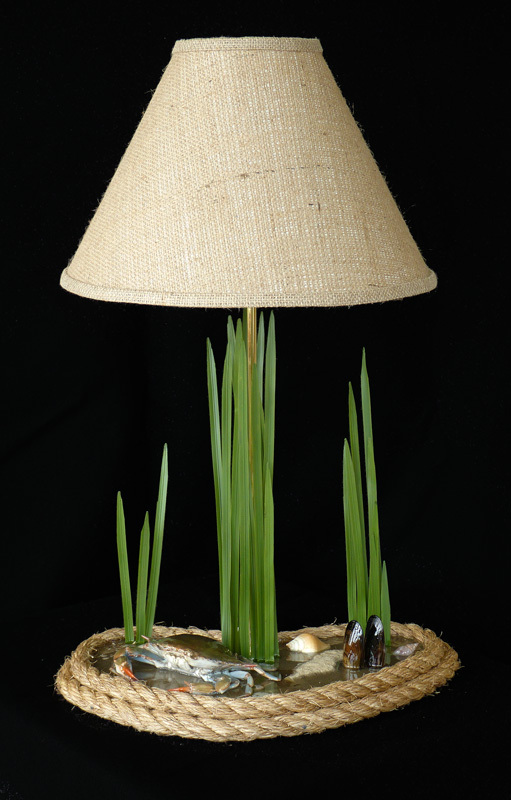 Please see the first pictured blue crab art lamp to see how your lamp will look with shade and socket. 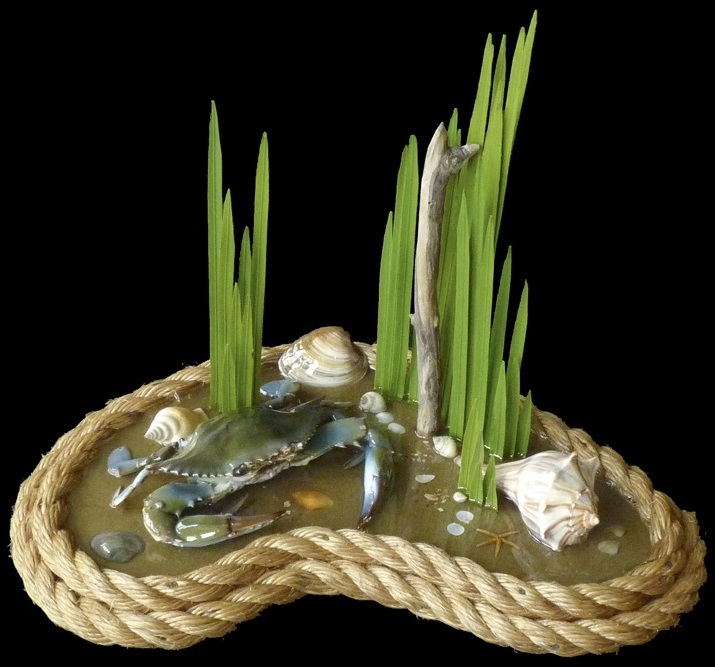 Small kidney blue crab nautical art lamp with mussels and assorted seashells. Dimensions are about 16 inches long and 11 inches wide at widest point from front to back. Double beveled layers of manila rope add a extra nautical touch. 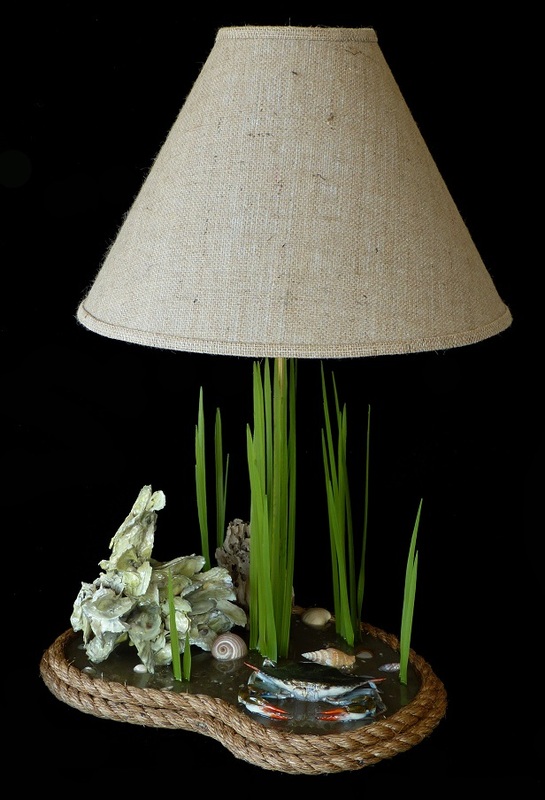 Your seashell assortment in this lamp will include at least 1 sand dollar, 1 starfish and 1 whelk or spider conch along with periwinkles plus a mix of small shells. Pictured is a table piece, but a lamp can be made for you. I used a table piece item for this pic - lamp pic coming soon. 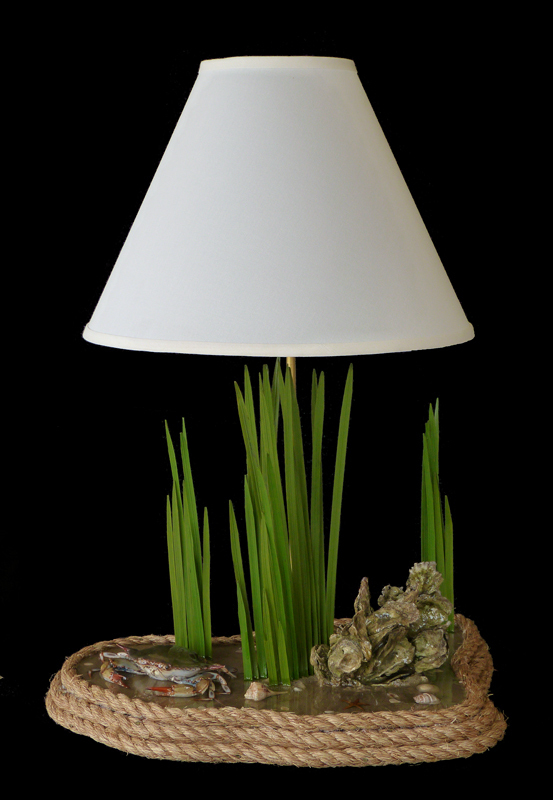 A few nice singles or a oyster cluster will adorn your lamp along with some clams and of course periwinkles. One of the coolest most unique nautical lamps you will ever see. Expect some differences in each lamp. Overall dimensions of the large oval lamp bases are 20 inches long and 14 inches wide which still leaves plenty of room on standard sized end tables. Burlap shade dimensions are 6 x 18 x 13 inches top, bottom and side. Blue crabs used for large lamps are at least 6 inches across the back measured tip to tip. Picture taken at slight angle to reduce reflection - lamp rod does not shown when viewed head straight on. No picture at this time. Be the first to order one of these naturally beautiful and rare pieces and a image of your piece will be placed here. 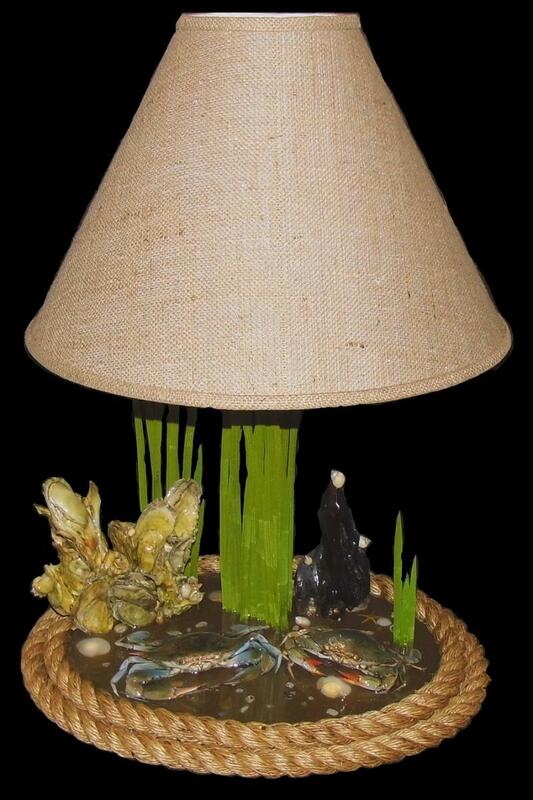 Large Kidney Blue Crab Nautical Art Lamp With Oysters and Clams and assorted seashells. The perfect lighting for the waterfront home. Overall dimensions of the large kidney lamp bases are 20 inches long and 14 inches wide which still leaves plenty of room on standard sized end tables. Burlap shade dimensions are 6 x 18 x 13 inches top, bottom and side. Blue crabs used for large lamps are at least 6 inches across the back measured tip to tip. No picture at this time. Be the first to order one of these naturally beautiful and rare pieces and a image of your piece will be placed here. Perfect for the beach house especially on the Atlantic or Gulf coast. NOT SOLD IN STOES! Triple Layers of 3/4 inch manilla rope, oyster cluster, assorted seahsells and a shrimp or two hiding behind the artificial marsh all set in crystal clear artifial water. Bases are 20 inches long and 14 inches wide which still leaves plenty of room on standard sized end tables. Burlap shade dimensions are 6 x 18 x 13 inches top, bottom and side. Blue crabs used for large lamps are at least 6 inches across the back measured tip to tip. White Linen Shade available as pictured by request. ﻿This one is sold but I will be happy to make a custom one just for you. 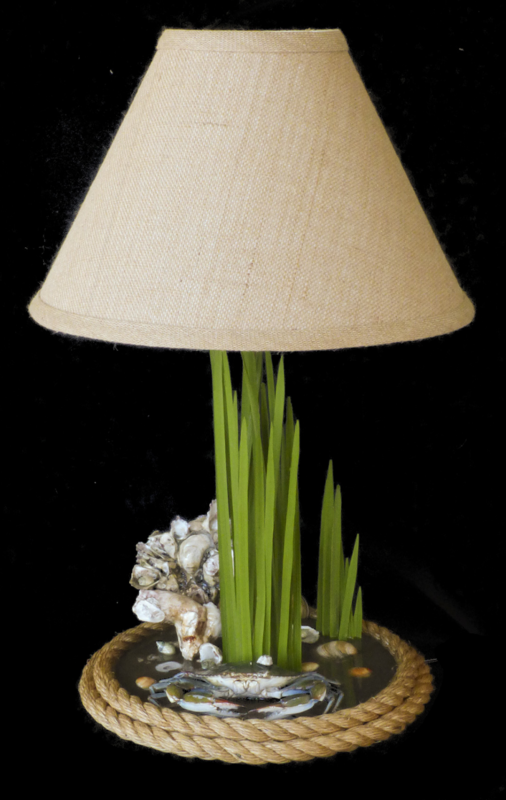 Custom made coastal blue crab art table lamps are a guaranteed conversation starter for your beach or shoreside home.